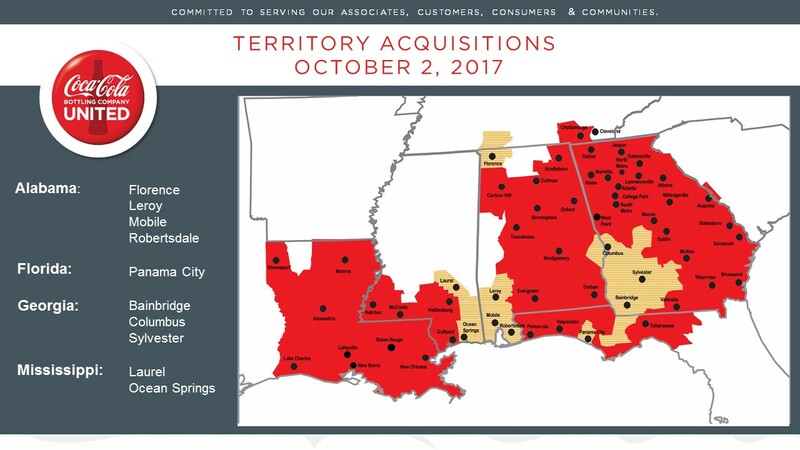 Columbus, Ga. (October 2, 2017) – Coca-Cola Bottling Company UNITED, Inc. (“UNITED”), headquartered in Birmingham, Ala., announced today that it closed transactions with Coca-Cola Bottling Co. Consolidated and The Coca-Cola Company (“The Company”) for the acquisition of 10 new sales and distribution territories throughout the southeastern United States, including Columbus, Ga. UNITED also acquired a production facility in Mobile, Ala.
As a part of the Columbus acquisition, the company has increased employment by 10 percent. “The City of Columbus welcomes Coca-Cola UNITED to our community. With their tradition of community support and involvement, along with the additional employees and prospect of economic growth, the city looks forward to continuing our partnership with Columbus Coca-Cola and its new parent company,” said Teresa Tomlinson, Mayor of Columbus. In addition to Columbus, UNITED also announced that it acquired the following territories: Florence, Mobile, Robertsdale and Leroy in Alabama; Bainbridge and Sylvester in Georgia; Laurel and Ocean Springs in Mississippi; and Panama City in Florida. More than 920 associates have joined Coca-Cola UNITED as part of today’s acquisitions. In addition, 100 new employees have been added to support UNITED’s commitment to providing dedicated and unparalleled customer service and strong community engagement. UNITED also plans to invest more than $9 million in infrastructure, facility improvements and fleet throughout these new territories. Today’s closings are the culmination of four years of acquisitions for Coca-Cola Bottling Company UNITED, which were part of The Coca-Cola Company’s more broadly-based refranchising efforts throughout the United States. The Coca-Cola Company developed its 21st Century Beverage Partnership Model, internally called “System of the Future,” to align bottlers and optimize their capability to better serve customers and maintain strong, local ties across diverse Coca-Cola markets. 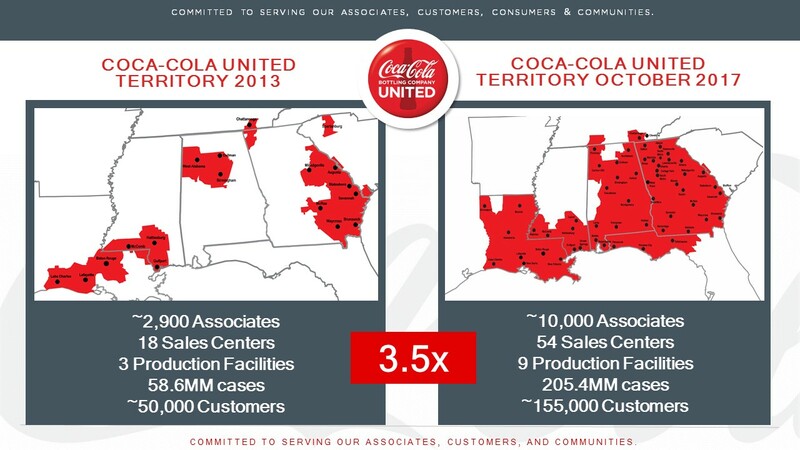 Coca-Cola UNITED – the largest privately held Coca-Cola bottler in North America and third largest in the U.S. – now has approximately 10,000 associates, located in 54 sales and distribution centers and nine production facilities throughout seven southeastern states. Its business has more than tripled since 2014, when it had some 2,900 associates located in 18 sales centers and three production facilities. At that time, the company had some 50,000 customers. Today, it has more than 150,000 retail and on premise customers in the states of Alabama, Florida, Georgia, Louisiana, Mississippi, South Carolina and Tennessee. Coca-Cola Bottling Company UNITED, Inc., founded in 1902 and headquartered in Birmingham, Alabama, is the largest privately held Coca-Cola bottler in North America and the third largest bottler of Coca-Cola products in the U.S. Among the franchises operated by UNITED include Chattanooga, the world’s first Coca-Cola bottler, and Atlanta, headquarters of the worldwide Coca-Cola System. The Company is engaged in the production, sales and distribution of a diverse portfolio of leading sparkling (Coca-Cola®, diet Coke®, Coke Zero Sugar®, Dr Pepper®, Sprite® and Fanta®) and still (Smart Water®, Dasani®, PowerAde®, Gold Peak®, Monster® and Minute Maid®) non-alcoholic brands under exclusive franchise agreements principally with The Coca-Cola Company and the Dr Pepper® Company. For more than 115 years, excellent customer service and strong community engagement built on local relationships have been the foundation of the company’s operating model. Since inception, Coca-Cola UNITED has remained true to its foundational core values of: Quality, Excellence, Integrity and Respect.